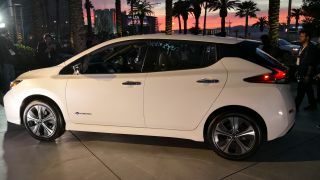 The latest version of Nissan’s Leaf has been unveiled at CES 2019, and it features a subtle but reassuring twist for any potential owners who suffer from range anxiety. Top of the pile is the Nissan Leaf 3.Zero e+ Limited Edition, which boasts a higher output. The fun and funky saloon, best known for its wonderfully addictive e-Pedal, will deliver 160kW (217 PS) of power, 340Nm of torque and a predicted 239 mile range from one charge of the 62 kWh capacity battery. The Leaf 3.Zero e+ Limited Edition will deliver a 40% range increase over another cheaper edition of the car, the Leaf 3.Zero, which is equipped with a 40 kWh battery. Anyone worried about making it from A to B will most likely want to plump for the model with the beefier battery, which is predicted to deliver up to 62 miles more on one charge. Nissan chose CES 2019 to show off the more muscular model, along with showcasing its Invisible-to-Visible (I2V) technology concept that aims to add another dimension to your driving in the future. We got to experience this I2V idea first-hand with an in-car demo in front of the assembled masses. It involved donning a bonkers-looking VR headset while we sat inside a four-seat futuristic mock-up car and then proceeded to wend our way around winding mountain roads. A virtual racing driver kindly offered up some top tips for making it around the tortuous bends. The system also works by letting you know what might be lying around blind corners, which if it could become a reality would be extremely helpful when it comes to not hitting things. Meanwhile, back around a virtual city centre, the Invisible-to-Visible demo located hard-to-find parking spaces by scanning a multi-storey car park and locating a vacant spot. At the end of it all we got an SD card record of what we’d just experienced, just in case it all seemed like one of those CES dreams that you tend to get after experiencing tech overload for a few days. It’s an interesting concept that remains just that for now, but after going for a real drive out into the desert in a US-edition of the Leaf a little later we rediscovered that there’s more than enough to keep you entertained with this battery-powered bundle of fun. Better still, the Leaf is a breeze to work through the ridiculously congested streets of Las Vegas with CES in full swing. The e-Pedal lets you nurse the car in and out of queues, junctions and car parks with minimal fuss and bother. And, let’s not forget, around town and shorter urban journeys is what most Leaf owners will probably be doing anyway. The new car itself is pretty similar to the earlier incarnation, although there are some minor style flourishes, such as a lip on the bottom of the front bumper, an e+ logo on the charging socket cover and cool two-tone colour combinations. Inside the car there’s going to be a bigger eight-inch infotainment screen to replace the existing 7-inch offering and it will include recent additions such as the door-to-door navigation system. A NissanConnect EV app will also be available. Also featuring in the revised models is the ProPilot system, which aims to make everyday driving life easier with a selection of options that let the car maintain your speed, keep you in your chosen driving lane and offering assistance with braking. On the Tekna edition the ProPilot park system can get you into a space automatically too. In fact, the Leaf comes with enough tech appeal that makes it wonderfully easy to drive, but at the same time, the EV is a really tempting proposition because of it’s torque-y electric motor and the aforementioned e-Pedal that spices up any kind of journey. The Leaf 3.Zero will be priced from £31,095 including the £3,500 UK Government Plug-in Car Grantwith. The e+ Limited Edition will be priced from £36,795 including Government Grant. Prices for the US and Australia are yet to be announced. Nissan’s lovable electric car was the highest selling electric vehicle in Europe in 2018 and, with that new and improved range, could tempt even more people to dip a toe into the world of the EV.